The total solar eclipse on Monday August 21st, 2017 was an incredible thing to witness. 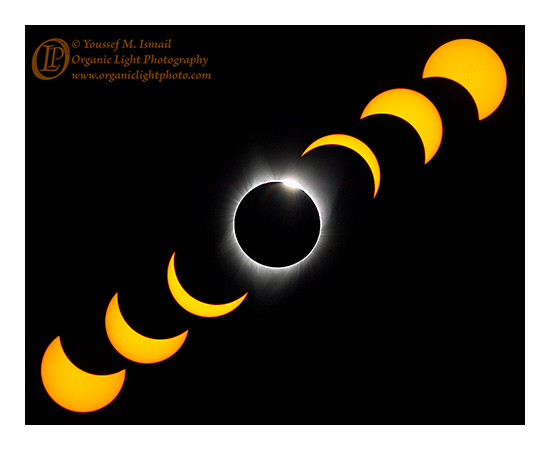 From the slow and steady progression of the partial phases, to seeing the moon totally obscure the sun and the land going dark, to seeing the corona and the diamond just as totality ended, to the throngs of viewers who came out to watch, it was in all aspects totally awesome! 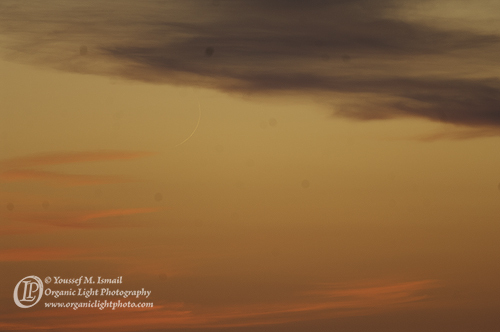 A time lapse composite showing several partial phases and the famed diamond ring phenomenon. A more accurate orientation of how the sun and moon moved in relation to one another. 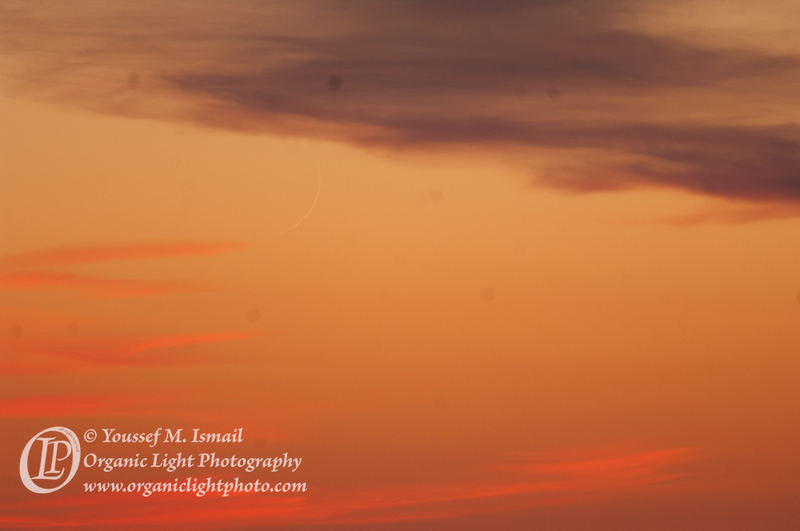 The sun in this composite photo is moving from the bottom left corner to the upper right as it climbed in the morning sky, while the moon was moving from the upper right to the lower left corners as it was passing through its descending node of its orbit (more on that later), and the two met in the middle. Just before they parted ways the Diamond Ring effect happens as shown in the middle. All that glitters is not just gold. 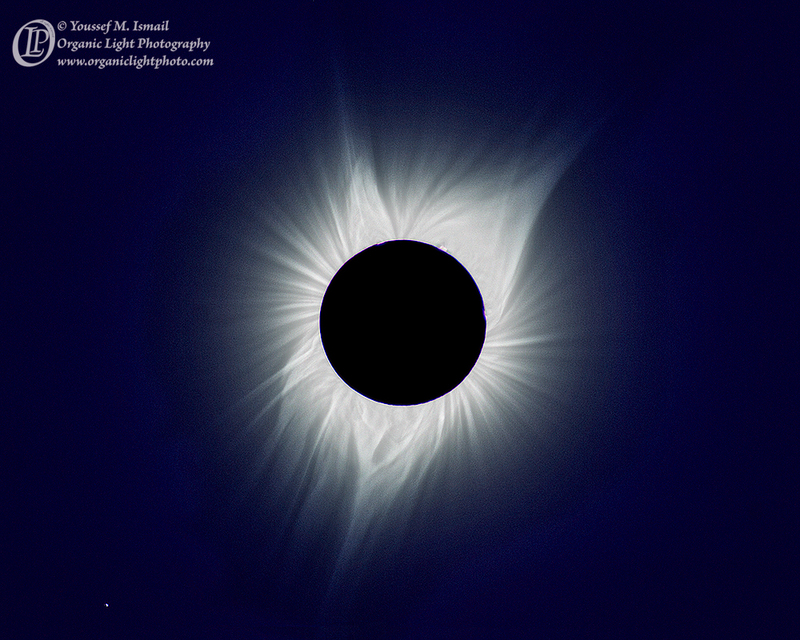 The crowning photo (pun intended) is of the Corona during totality. It was the processing of this photo that caused my delay in presenting these to you. 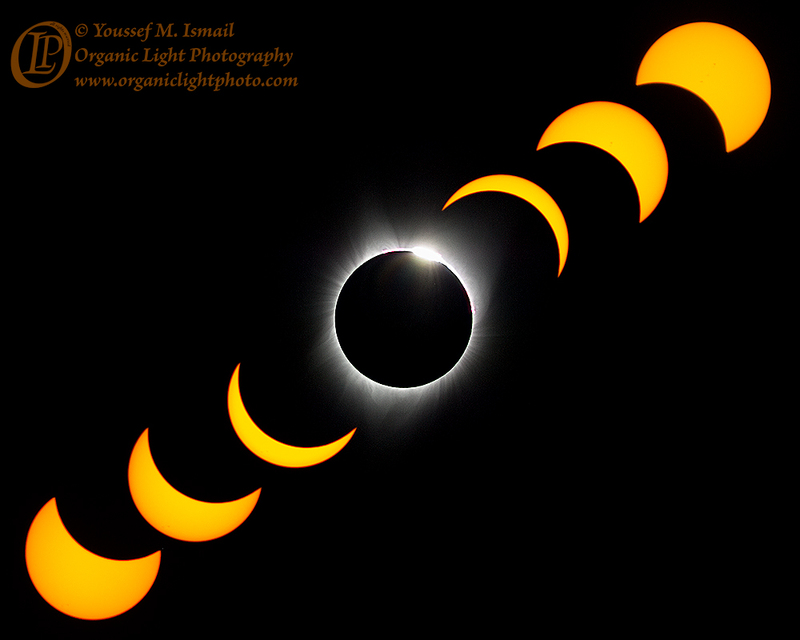 I made dozens of exposures of the totality in an attempt to capture detail in all parts of the corona itself. 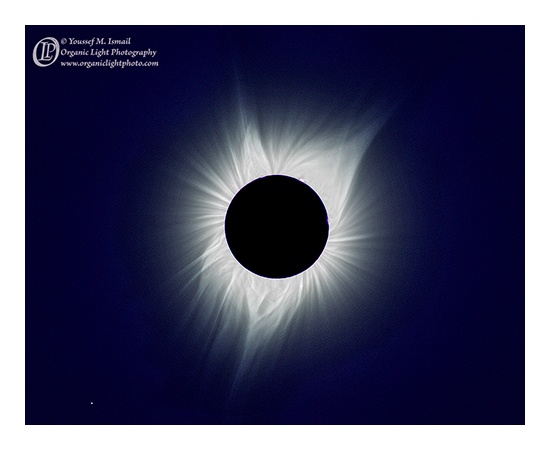 Eight separate exposures were combined through a variety of digital imaging techniques to bring out the detail throughout the corona and produce an image that to my eyes looks as close to what I recall seeing at the time when totality took place. The moon wearing the crown of the sun, completely overshadows the now lowly star Regulus, “The Little King” as it is known, hanging out just below and to the left of the union in total awe like the rest of us. You may click on the images above to see larger versions. 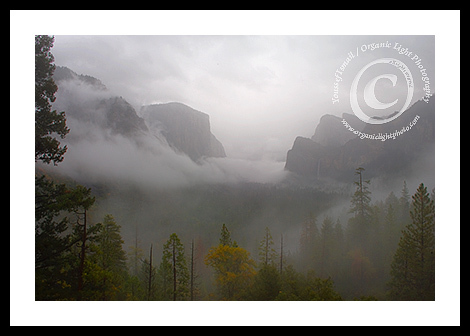 If you would like to see these photographs in person, I will be showing them at the Campbell’s Farmers Market on Sundays in downtown Campbell. Please come by if you are a local! Till later, please enjoy the photos and let me know what you think. I want to be open and clear in my endeavors about moon sighting. 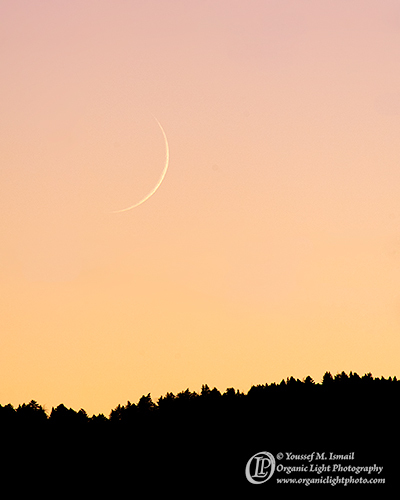 I do not want anyone to feel any doubt or lack any certainty about the reports that I give regarding the sighting of the new moon. Let me start by noting that I have been involved in sighting the moon since 1993, and I have gone out nearly every month since then. I have studied the moon and its motion in the sky. I am well-read on the science behind its motion and the mathematical technique employed today on predicting where the moon could be seen. Over the years, I have developed my own set of criteria as to whether or not I think the moon will be seen. I also contribute to making final decisions almost every month as to the beginning of the Islamic months with other moon sighters and committees across the United States. 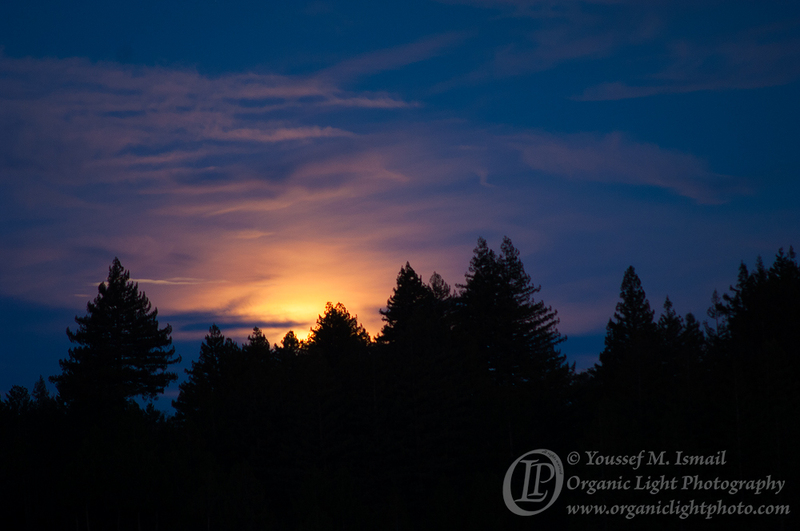 The moon was not going to be easily seen because the lag time and the altitude at sunset were very close to the minimum values needed to see the moon easily. 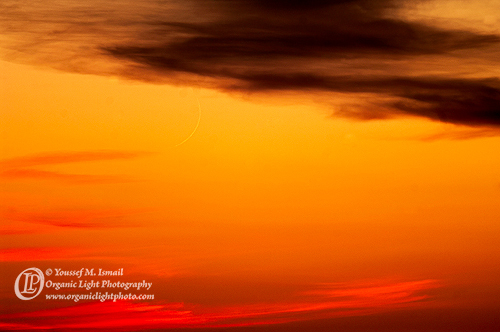 Predicting the visibility of the new crescent moon has been an endeavor that dates back thousands of years. In 1997 and then updated in 1998, B.D. 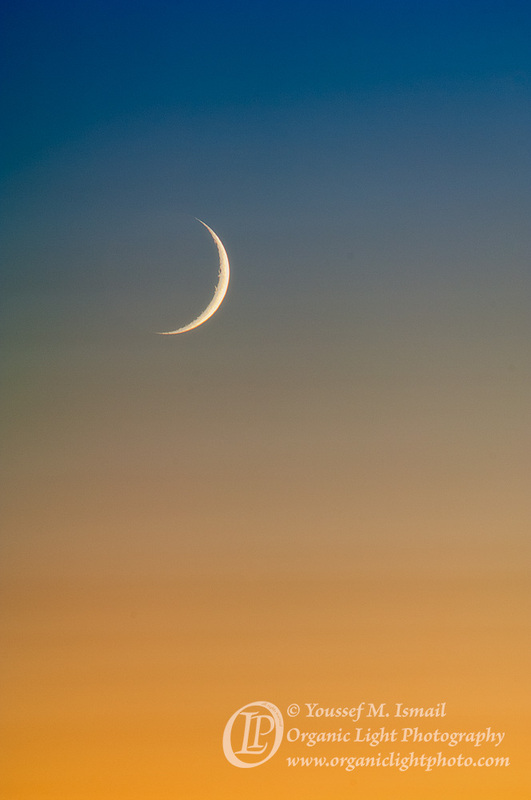 Yallop working for the HM Nautical Almanac Office, surveyed the methods used historically and those used in the twentieth century and developed a new criteria to predict new crescent moon visibility. if interested, Yallop’s paper can be obtained HERE. Every numerical moon prediction method used today works off of the Yallop method. Among the parameters that I mention and use above, Yallop determined that there was a mathematical functional relation between the geocentric difference in altitude between the center of the sun and the center of the moon for a given latitude and longitude on the earth, ignoring the effects of refraction, and the topocentric width of the crescent moon. In fact, Yallop found that the difference in the altitude was a cubic function of the topocentric crescent width. Let me explain some of these terms. First, let me explain the altitude. Altitude is a measure of a celestial objects distance above the horizon as seen by an observer on the surface of the earth. There are two ways to calculate it, geocentrically and topocentrically. The geocentric calculation assumes that one is at the physical center of the sphere of the earth and the line connecting the center of the earth and the moon. This altitude is measured off of the equator of the earth. The topocentric calculation assumes one is standing on the surface of the earth and the line connecting the location on the earth and the moon does not necessarily pass through the center of the earth. The following diagram shows the two different angles. 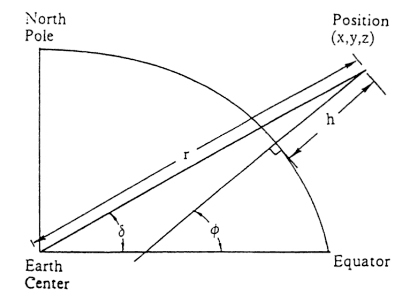 Diagram showing Geocentric and Topocentric altitude. The angle delta, δ, indicates the Geocentric altitude and the angle phi, φ, indicates the Topocentric altitude. The topocentric altitude is of course easier to measure as one stands on the surface of the earth. The difference in the geocentric altitude between the sun and the moon requires that this quantity be measured, or calculated, for both the sun and the moon and then the difference between those two values determined. If the sun happens to be on the horizon it will have essentially a zero altitude by definition. If the moon happens to still be in the sky above the sun then the difference in the altitudes will be a positive number. If the moon had set before the sun, then the moon will be below the horizon and the difference in the altitudes would be a negative number. Thus, the difference in the altitudes is always computed at the time of sunset for any given location on the earth. The resulting number is then just the actual altitude of the moon above the horizon. The altitude is measured in degrees and one can use a clinometer to easily measure the topocentric altitude of any celestial object, including the moon. Check here if you would like to make your own clinometer. To determine the geocentric altitude of the object one would need to employ trigonometry and some algebra, which is beyond the scope of the article at this time, but can be found by searching for it online if one desires. Next is the topocentric crescent width. 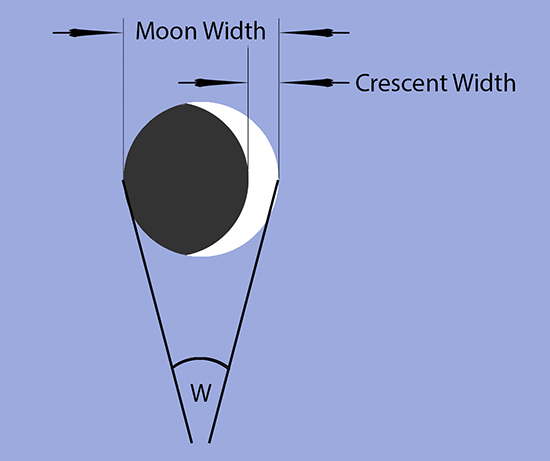 This parameter measures the width of the visible portion of the moon. 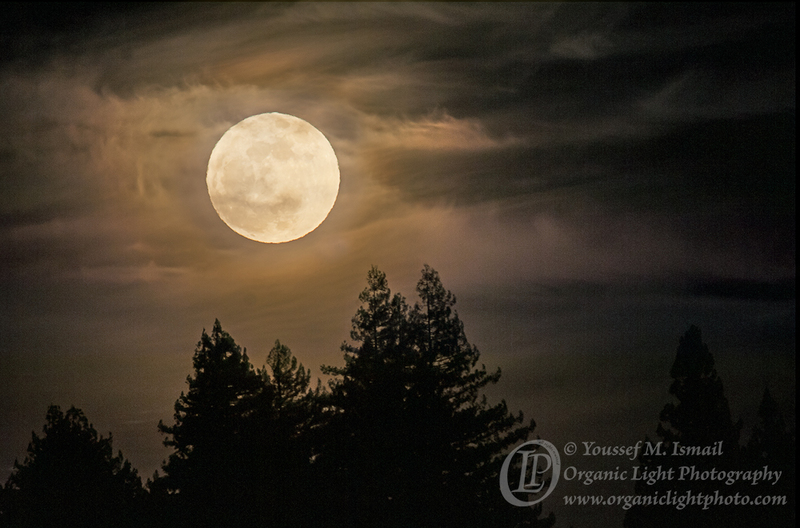 The width of the moon is measured by an angle that subtends the moon as measured from earth. In the figure below it would be the angle given by W. From the earth the moon’s width measures approximately 0.5° or 30 arc minutes. It varies slightly from month to month depending on the distance between the earth and moon as the moon follows an elliptical path around the earth, sometimes a bit closer and sometimes a bit farther. 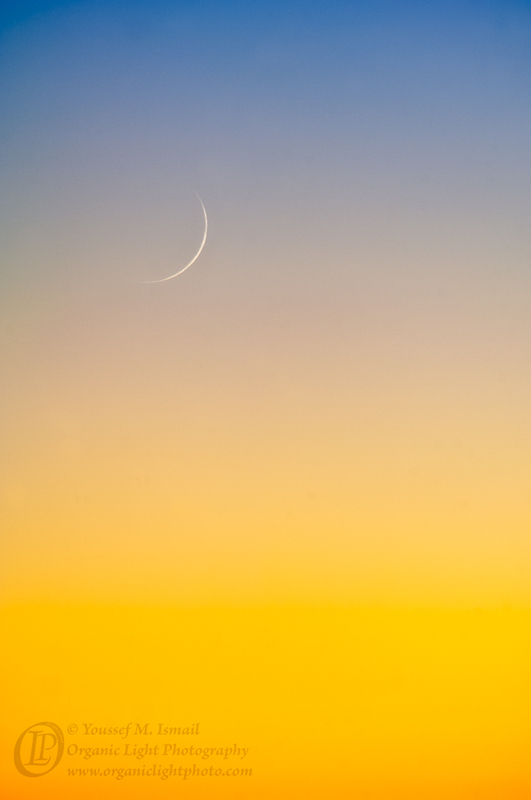 The width of the crescent is of course less than the 30 arc minutes and will continuously grow from zero to a full 0.5 degrees when the moon is full. In terms of arc seconds, the moon is 1800 arc seconds wide (60 arc seconds in every arc minute). 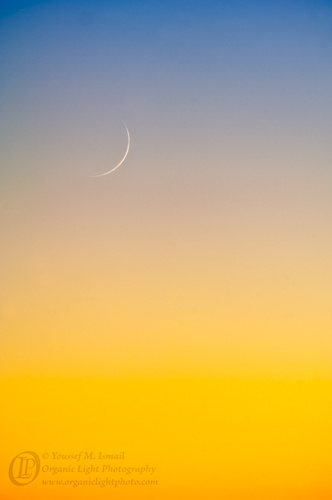 A one percent (1%) illuminated moon corresponds to a crescent width of only 18 arc seconds wide, and a 19 arc second wide moon corresponds to roughly 1.05% illumination. The crescent width is directly related to another parameter mentioned above and that is the Elongation. 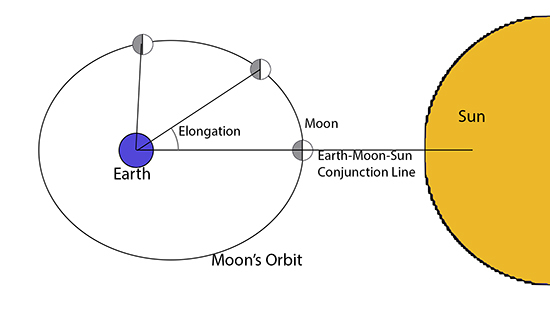 The elongation is also an angular measure that determines the position of the moon relative to the earth and sun. 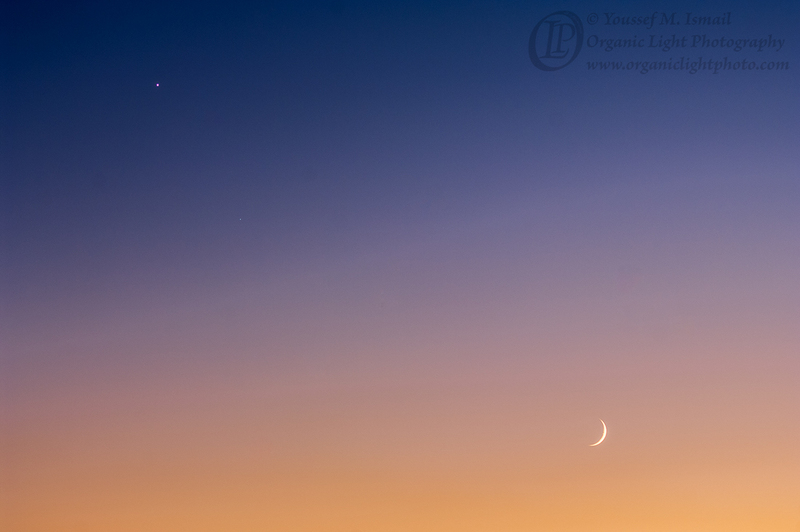 At conjunction the moon lines up with the earth and sun along what is known as the earth-moon-sun conjunction line. The diagram below shows the new moon orientation with the moon on the conjunction line, as well as showing the moon in two other positions later in its orbit around the earth. As the moon continues to move away from the conjunction line, the elongation angle continues to grow. 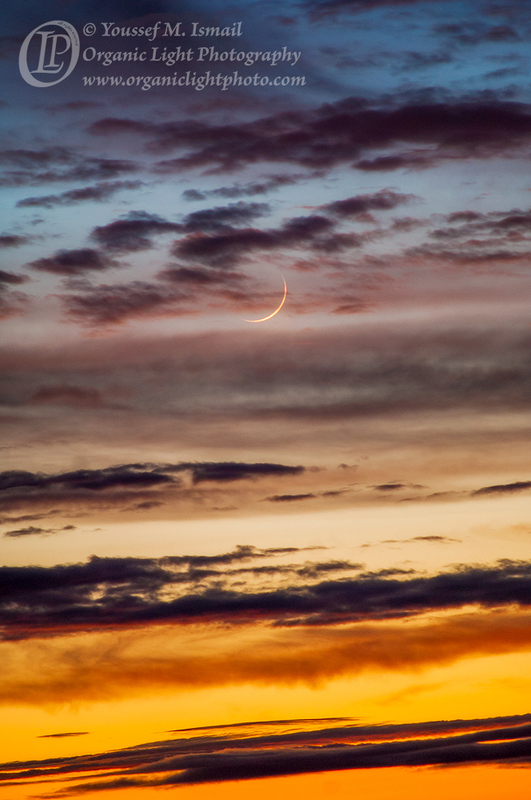 As the moon moves along in its orbit past conjunction, the visible portion of the moon gets larger as more reflected light from the sun can bounce off and find its way down to the earth where we can view it. Yallop had also discovered a mathematical functional relationship between the difference in the geocentric altitudes and the elongation and the difference in the azimuths of the moon and sun. With this other relationship Yallop was able to come up with quadratic function that related the difference in the altitudes to the difference in the azimuths of the sun and moon. So how are the probability curves generated? Using a data set of 295 sighting reports in the past, the locations of where those sightings occurred were plotted on a map of the earth based on their latitude and longitude. Then for a given date the necessary parameters, altitudes and azimuths are computed using astronomical calculations. Given the values of the altitudes and azimuths along with the result of each individual sighting from the data set, whether the moon was seen or not seen, and whether it was seen by the unaided eye or with an optical aid, a parabolic curve is plotted on the map to fit the data as best as possible. The parabolic curve is used as it will best fit the quadratic function determined by Yallop. The technique used is called Least Squares Curve Fitting and it is a statistical method that uses pre-existing data to fit a line or other curve, such as a parabola in this case, to the data that gives the best possible fit while minimizing errors. The larger the data set used the more accurate the curve fitting becomes. Yallop initially used 295 data points and from that set determined six visibility zones; Zone A – Easily Visible to the Unaided Eye, Zone B – Visible Under Perfect Atmospheric Conditions, Zone C – Visible to the Unaided Eye After Found with Optical Aid, Zone D – Only Visible with Binoculars or Conventional Telescopes, Zone E – Not Visible with Conventional Telescopes and Zone F – Not Visible Below Danjon Limit of 7°. The Danjon Limit is the minimum elongation angle that will allow sunlight reflecting off of the moon to reach the earth. 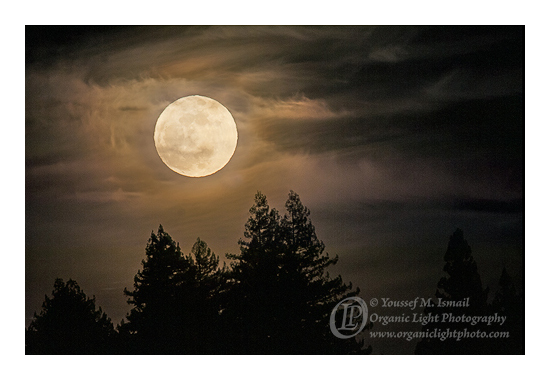 Below a 7° elongation there is not enough light reflecting off of the moon that it could be seen by any means. Numerically the six zones are determined by the following values: Zone A – q > +0.216, Zone B – +0.216 ≥ q > -0.014, Zone C – -0.014 ≥ q > -0.16, Zone D – -0.16 ≥ q > -0.232, Zone E – -0.232 ≥ q > -0.293, Zone F – q ≥ -0.293. Note that in moving from one zone to the next, the values of the determination parameter have common borders. Zone A and B have a common border along the 0.216 parabola line, Zone B and C along the -0.014 parabola line, Zone C and D along the -0.16 parabola line, Zone D and E along the -0.232 parabola line and finally Zone E and F along the -0.293 parabola line. Even though the above inequalities are designed to ensure any given location can be in one and only one zone, there is no margin of error between the zones and this raises many questions. What if one was standing exactly on one of the parabola lines that delineates one zone from the next? What prediction does one rely on? How far into any given zone must one move to ensure that the zone one is in will be the predictor of the probability indicated? Again, the Yallop criteria, a statistical method using past sighting data to predict probable future sightings and the larger the data set the better the curve fit and the better the prediction of probable sighting. 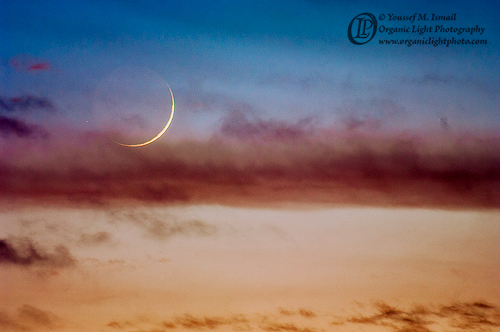 The Yallop criteria for the moon on June 5th indicated that my area was in Zone C; that sighting the crescent was possible after using an optical aid to first locate the moon, however my location was very close to the border line of Zone B, crescent visible under perfect atmospheric conditions. Aside from some wispy high clouds in limited portions of the sky, we had great atmospheric conditions for sighting the moon as I had ever seen. So what happened this past Sunday evening? Our group arrived at our viewing location, Russian Ridge Open Space Preserve along the Ridge Trail, with the following coordinates 37.3247 N 122.2087 W at an elevation of 2359 feet around 7:45 pm to 8:00 pm local PDT. We waited for the sun to set before we started to look. I knew the moon’s azimuth would be about 10 degrees to the left of the sun, approximately 1 hand span, and 6.5 degrees above the horizon, approximately 2 to 3 fingers above the horizon at the time of sunset. I directed everyone to concentrate on that location of the sky. We all looked intently. 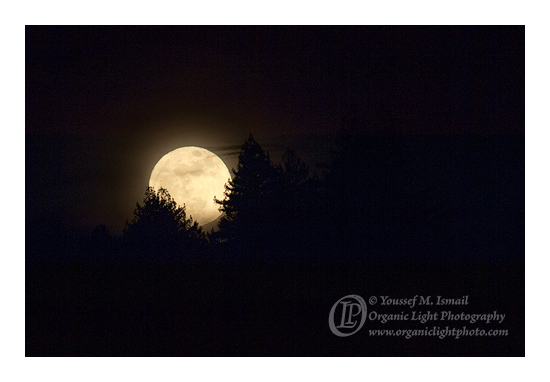 The prime time to see the moon occurs at a time that is 4/9 of the lag time after sunset, a time determination that was also discussed by Yallop in the same above mentioned paper. 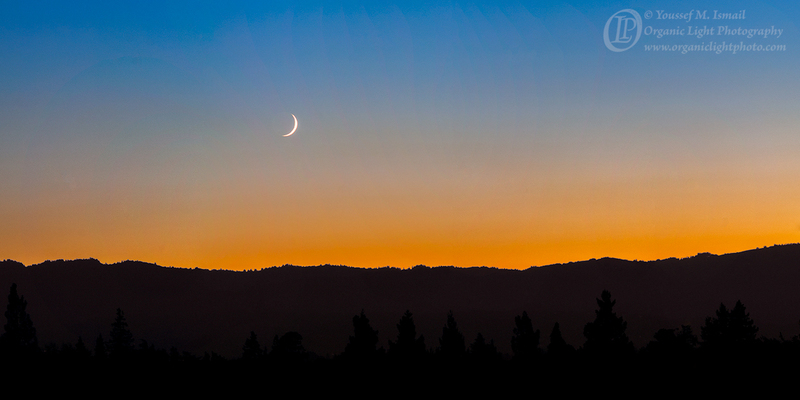 At our location sunset occurred at 8:26 pm PDT. 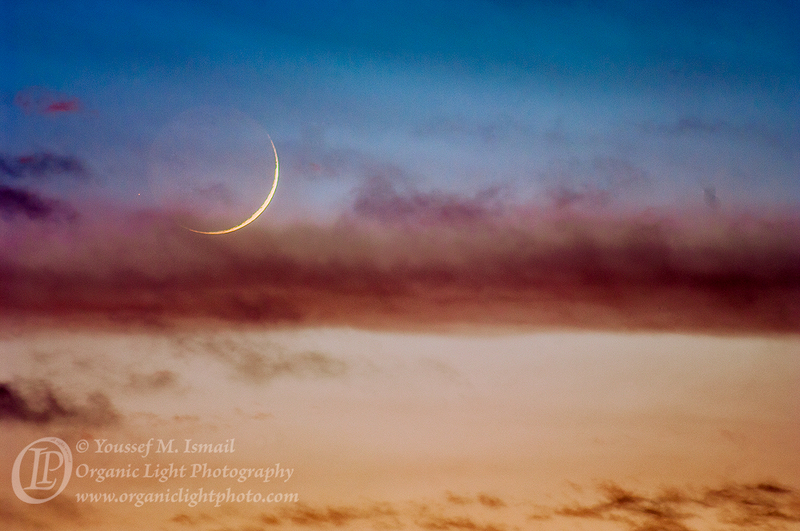 The moon set was at 9:08 pm PDT, and 4/9 of 42 minutes is 18 minutes and 20 seconds. This placed the best viewing time at 8:44 pm. Hence, as soon as it was 8:44 pm, we all started to double our searching efforts. 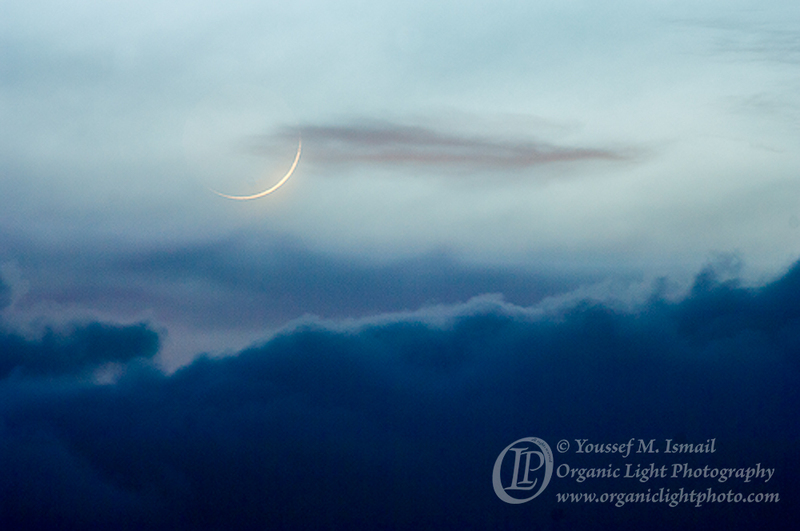 One from the group at this time thought that he saw its lower limb poking out from the clouds that were perched right where the moon was supposed to be. Then, a few moments later, another of the onlookers thought he saw it as well. The first person though had lost sight of it. Neither could confirm with certainty. At about 8:50 pm PDT, I pull out a pair of small low power 7 x 35 binoculars (see note below), and I search the sky along the bottom edge of the clouds that obstructed our view. Within moments, I confirmed what the other two had seen with their naked eyes: the bottom limb of the moon was indeed sticking out from the clouds. I moved the binoculars from my eyes, and I could clearly distinguish that the lower limb was visible and directed others to where it was. 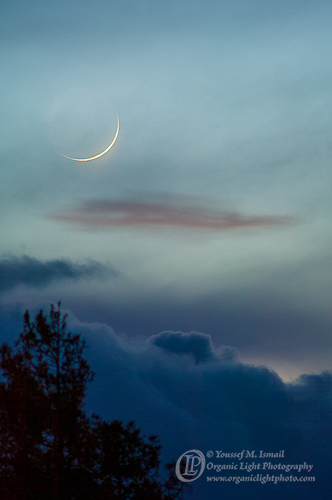 Within 5 minutes, the moon had completely dropped out of the clouds. At this point, I was able to see it clearly and at the same time faintly. 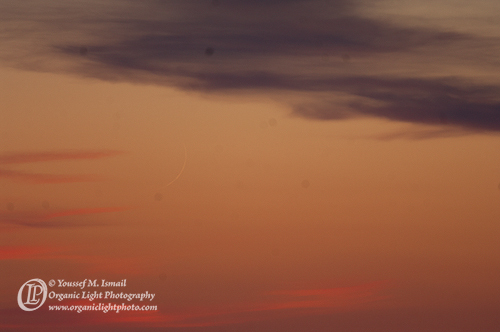 It was a very thin moon and one that was difficult to spot. However, when I directed the rest of the group to where it was in relation to clouds around it, the first two who had seen it, were able to see it once more, and they were followed by a third onlooker, then a fourth and then a fifth in addition to myself. 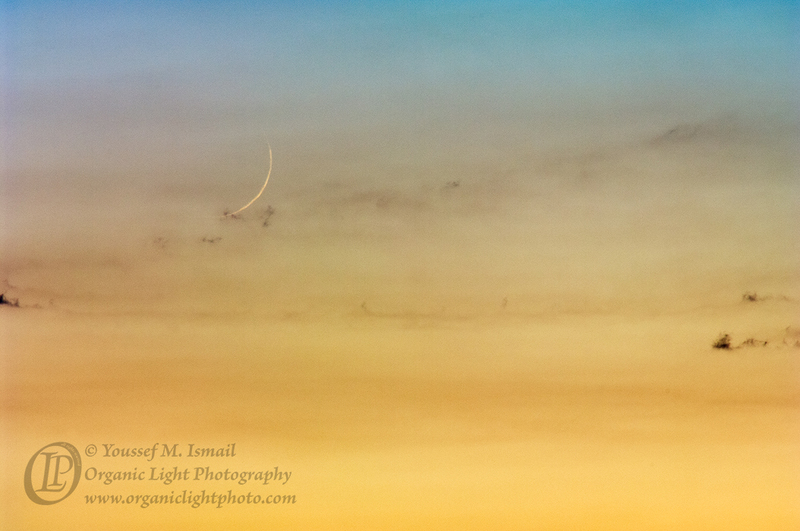 It was then that I trained my camera on the moon and made four photos, starting at 8:58 pm. By that time the moon had dropped to about 1 or 1.5 fingers above the horizon, approximately 3 degrees above the horizon in altitude. In all we were about 15 in number; most had a difficult time seeing it, but those of us who did see it, were certain we had seen it. We continued to watch it until just about 9:05 pm PDT when it had dropped so low that haze along the horizon was now obscuring the view. I made the first photo of it just as it dropped out of the clouds at 8:58 pm; however, I did not set the camera controls correctly, and the moving reflex mirror in the camera caused a vibration that blurred the moon. I then made the second of four photos immediately afterwards, this time locking the mirror in place before tripping the shutter. That second photo was the photo displayed on the June 5th post. 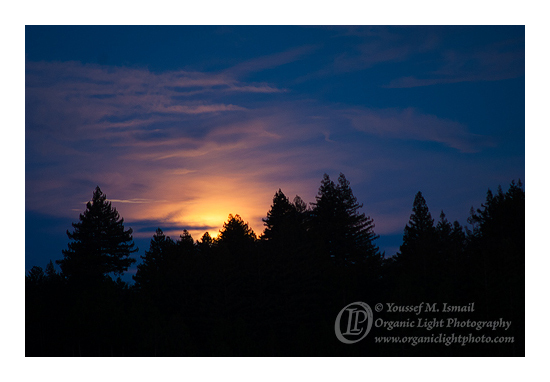 The third and fourth photos were made in the same manner however, the second photo showed the moon best. Furthermore, I have been photographing the new crescent moon with a digital camera for the last 8 years. I set the camera to photograph in RAW mode. A RAW file is not actually an image file, rather it is a file that records the CCD image sensor data as it was captured. An additional piece of software is needed to read the RAW file and covert it to an image file. In the RAW converter, I have control over the data, and I can set the exposure, brightness, contrast, highlight and shadow levels, color temperature as well as the saturation so that the image appears as best as I can recall at the time I made the photo. I cannot however, add an object that was not there, nor can I remove something that was there. Those operations can be accomplished, if so desired, in an image editing program like Photoshop. When the RAW file is opened in the converter it is very dull and with very low contrast and, in most cases, looks nothing like the actual scene. 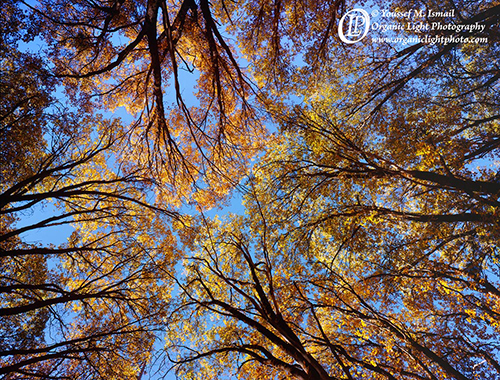 This is by design to ensure the darkest part of the image and the lightest part of the image contains actual detail. Pure black and pure white in a digital image contain no details at all. The four photos shown below are the four that I made on the evening of June 5th, without any adjustments made to the RAW files other than opening the files in the converter and then saving them as JPEG files for displaying on the web. Earlier that evening I was in contact with other colleagues that I work with in determining how to respond to other sighting claims from the United States and abroad. Positive sighting reports had come in from Peru and Chile but did not include the details that would have allowed us to evaluate the sightings. I was fairly certain that we would get reports from either Arizona or South Texas based on the Yallop probability curves for those areas, and sure enough, we did get a report from Frisco Texas. I personally interviewed the man who made that report, and it sounded like a valid report. He was not alone but had his wife and his adult daughter with him, and all three saw it. Furthermore, he did indicate to me that there were others in his area that had seen it as well. In discussing this report with my colleagues, we had decided to declare a positive sighting had been made but that we would wait until after sunset PDT to make the final call once we had a chance to search for the moon. I was already convinced that the month had started, and thus my “cheat” was more of a self edification than anything else. 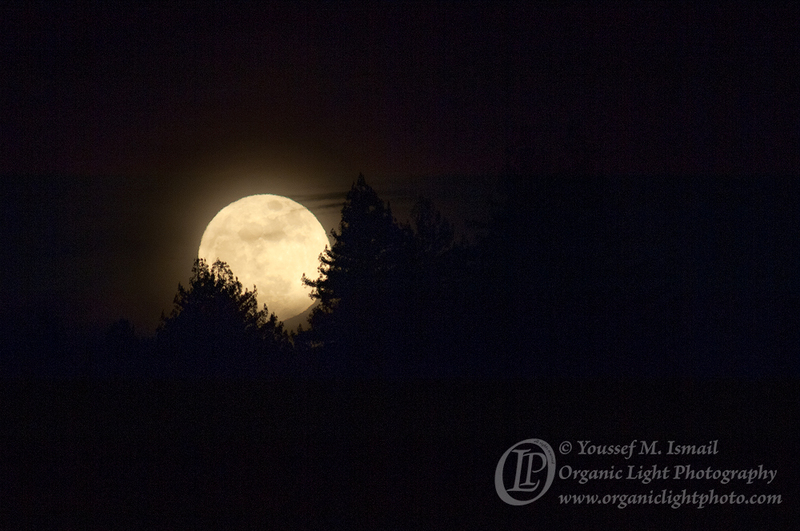 Once I established its location with the binoculars, I was able to direct others to seeing it, and once I pulled the binoculars from own eyes, the moon was there, faint, but clearly there, seen with my naked eyes, just as the Yallop curves had indicated. The other naked eye sightings were just that – naked eye sightings, as they did not use the binoculars, something the Yallop curves did not indicate. Finally going back to my criteria based on my sighting experience. The moon of June 5th at the location of our observation met all the criteria indicating that we should have been able to see the moon. 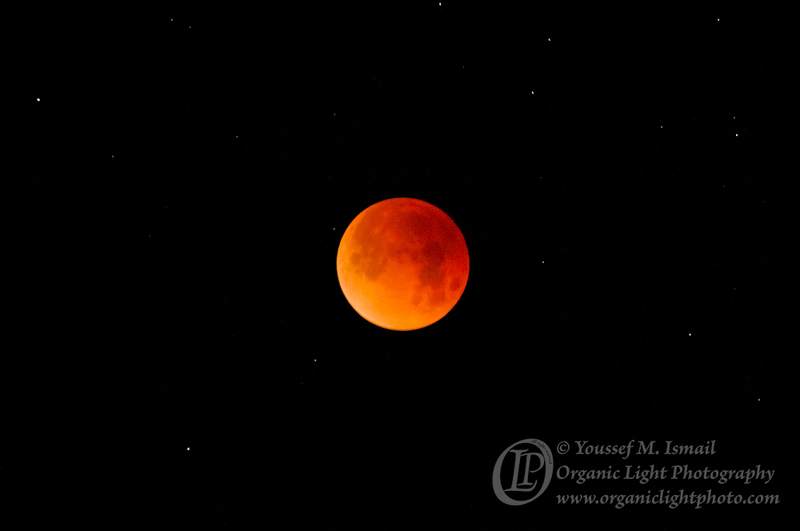 Since the lag time was very close to the minimum of 40 minutes and that the altitude of the moon was very close to the minimum of 5 degrees needed, it was going to be a difficult moon to see. Indeed it was a very difficult moon to see. 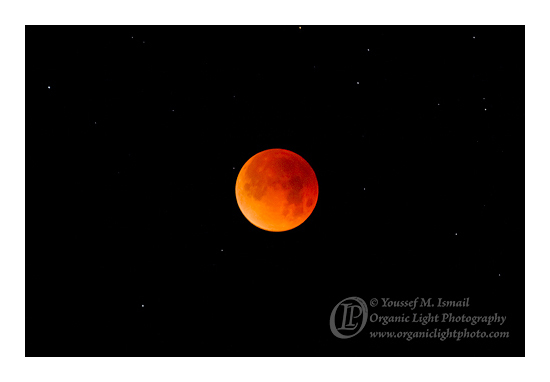 However, had we not had clouds to contend with that covered the portion of the sky at 8:44 pm where the moon should have been, we might have seen it earlier while it was at its optimum contrast. The first of the sighters who did think he saw the lower limb but then later lost it, did think he saw it at just about the time of optimum viewing of 8:44 pm. I would like people to understand that I would not have made the claim of seeing the moon if we did not actually see it with our naked eyes. The responsibility of making such a claim when it is not true carries a great burden; in fact, any time I make a claim to have seen the moon, a great burden comes along with it. I do not take moon sighting lightly. The worship of billions of Muslims sometimes rides on my sightings, and I am very careful with it. I hope this post settles any questions anyone might have had with the sighting that we made on June 5th. I ask that you all keep me and my team of moon sighters in your prayers and pray that we can continue to keep this Sunnah of our Prophet Muhammad (peace and blessings upon him) alive and well and that we can once again re-establish it as the dominant method of determining our religious months and holidays. Until next time, Peace to All and Ramadan Mubarak! 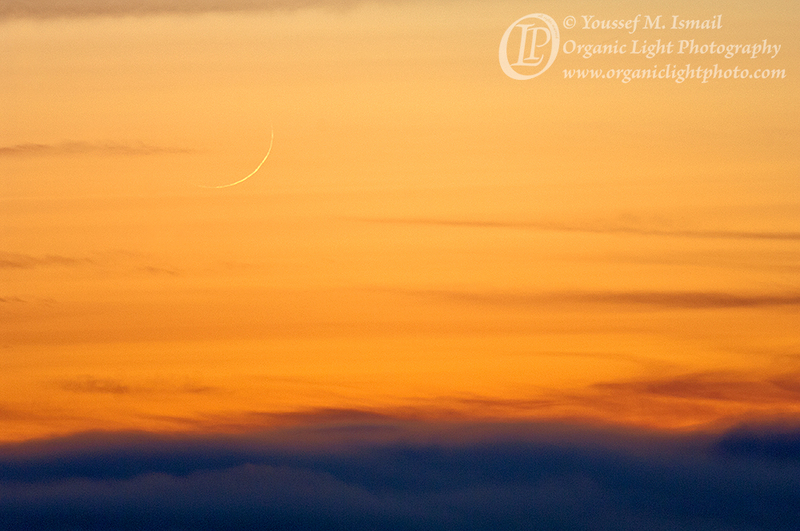 The new crescent moon of Ramadan 1437 (2016) was seen this evening by a group of crescent chasers on top the northern Santa Cruz Mountains in Russian Ridge Open Space Preserve. 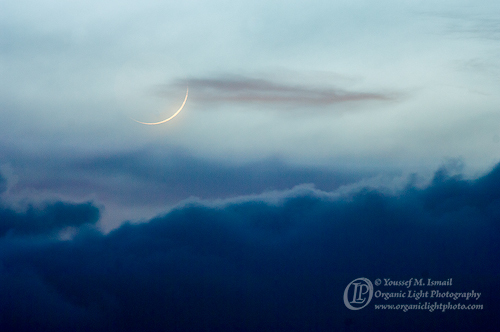 The sky was somewhat foreboding as it laced itself with clouds right where we expected the moon. 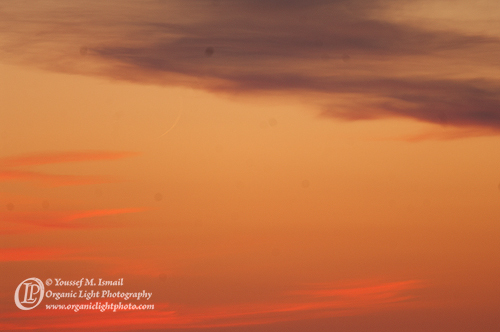 At about 8:45 pm, one of the chasers thought he saw it but he lost it in the clouds as the clouds moved. 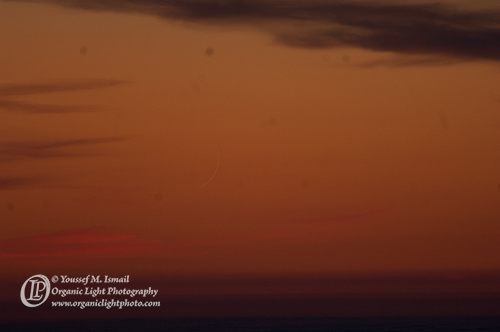 Then at about 8:55 pm we re-established its sighting as it once again re-emerged from the clouds. Several in the group of about 15 to 20 onlookers were able to see it. 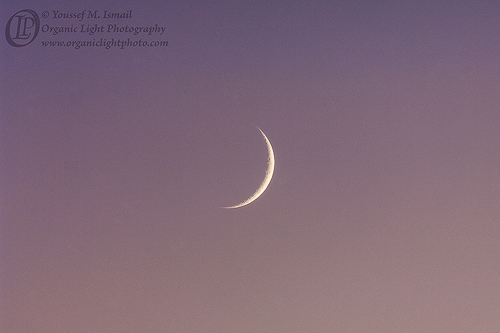 A fine a moon as I have ever seen, it was incredibly thin in a dim sky. Once we had it in our sites, I trained the camera on it and made four images. This one shows it best. The sight of the new moon never ceases to amaze me. This one literally took my breath away when I saw it. I wish the photo could convey what I felt. Just a quick note to announce the beginning of the eight month of the Islamic calendar, Sha’baan, has commenced this evening. We tried to view this moon from our normal sighting location atop Russian Ridge in the Santa Cruz mountains, but fog, wind and a thick marine layer had completely obscured the view from there and any hope of seeing the new crescent. We rushed back down the mountains and directly to the top level of a parking structure of a local hospital. From there we had a clear view of the horizon and we waited there until we sighted it. Sha’baan is known as the Month of The Prophet. In this month the Prophet Muhammad, peace and blessing upon him, used to fast more than in any other month outside of Ramadan. It is also a month in which there is a night where those seeking forgiveness of God will find it if they ask. It is the night of the 15th day. So seek out your good fortune in this blessed month and until next time, Peace. In wrapping up the year many photographers try to pick their best photos from the year. I am not sure what makes a ‘Best Photo’. Is it the photo that was the most technically challenging? Is it the the photo that is artistic in either its composition or color or lack of color? Is it the photo that sold well or was the most popular with an audience? Some photographers ask other photographers to pick for them. Some photographers ask their audience to pick for them. 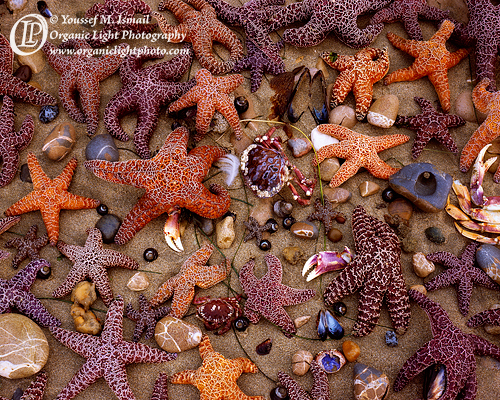 For me, its about what the photograph means, why I made the photo, how it makes me and others who look at it feel. Did the photo bring a sense of wonder, or awe or delight? Did it make me think or my audience think? Did it help me to form a bond with Mother Earth or with those that are dear to me? Those are the photos that would qualify as best. So what follows are my favorites from the past year and why. 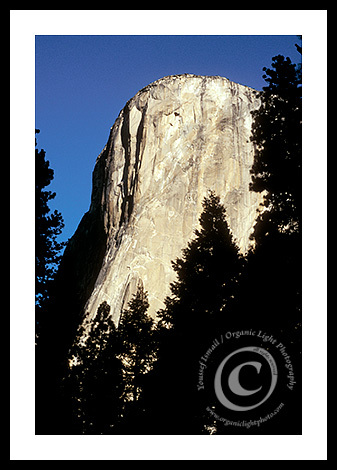 At the start of the year the full moon was rising over Half Dome in Yosemite and the high country was still accessible due to a lack of snow fall. The crew and I made the trek and it was a moving experience for all. Its the experience that makes a photo what it is sometimes and this one carries a lot with it. Later in the year, in early autumn, the crew and I ventured out to the coast at a low negative tide and discovered what lives under the water. 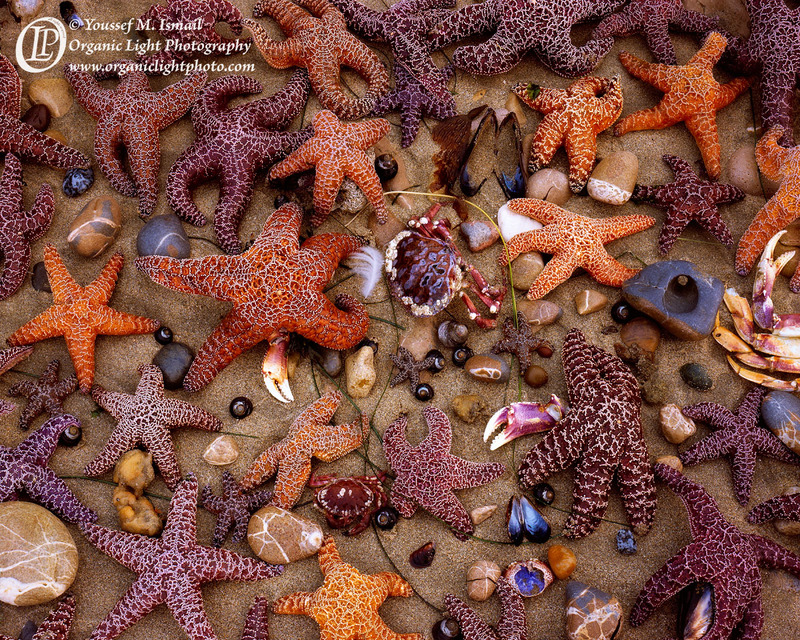 We spent the afternoon gathering sea stars and made this fabulous arrangement. the interactions that occurred that afternoon and on the evening ride home showed me something that I knew was inside of my crew but hardly had the chance to make an appearance. I saw stars, real stars and it was in the making of this photo that brought them out to shine. I also struggled this year with photography. Trendy photos, trendy ways of displaying them and trendy marketing all designed to persuade the viewing public to think mediocrity is something special. It was troubling me greatly and then by a strange twist of fate I found myself standing over a raging torrent of water at a location that attracts many tourists. Those who stop marvel at the water but I was looking in the opposite direction. What impressed upon me was that standing firm on what has a real foundation is the only thing that lasts. When all the madness has passed, what has remained is morality, character and tradition. That is what my photography rests on and hopefully others will see that as well. The heavens in 2012 were also produced events of amazement and wonder. 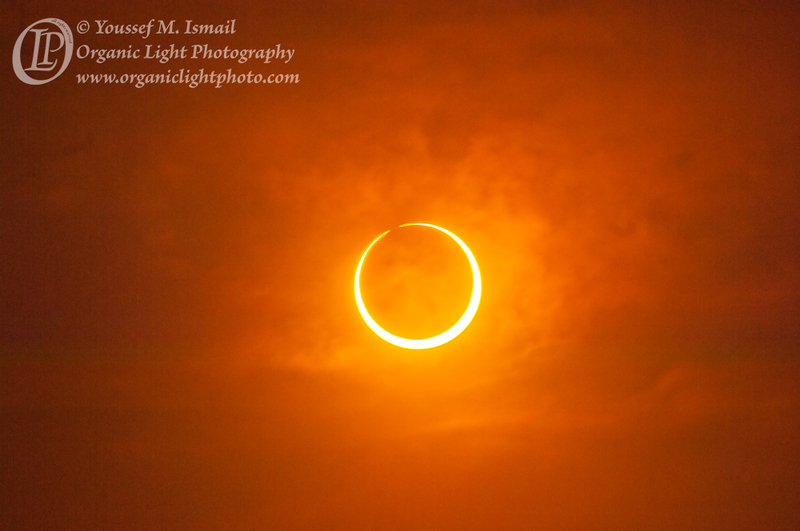 Most memorable was the annular eclipse of the sun. I planned a trip, determined a location prepared all the equipment both for the trip and the photography only to it all vaporize and morph into something entirely different. On the one hand it seemed like the endeavor was all in vain, but what resulted were some photographs that were as unique as the event itself. 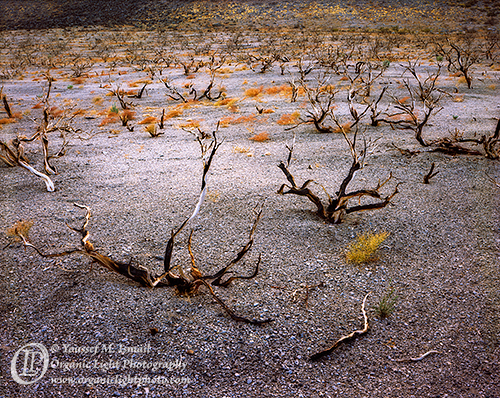 Many photographers produced interesting renditions, but I saw nothing like what I was given. It was amazing to see the moon and sun married in the sky together like that for several minutes. Intellectually I know that the moon passes in between the Earth and Sun each month. I know this because each month I am out trying to find and photograph the new crescent moon once it has passed conjunction and starts to reflect the faintest amount light back to the Earth. 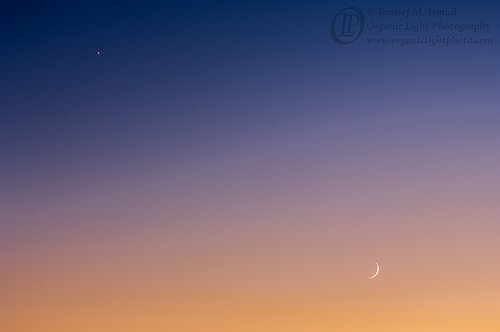 But seeing conjunction happen during a solar ecplipse brings seeing the new moon to a whole new level. A day later, after ‘Broken Light’ was made, it was the moon’s stage and the moon’s alone. 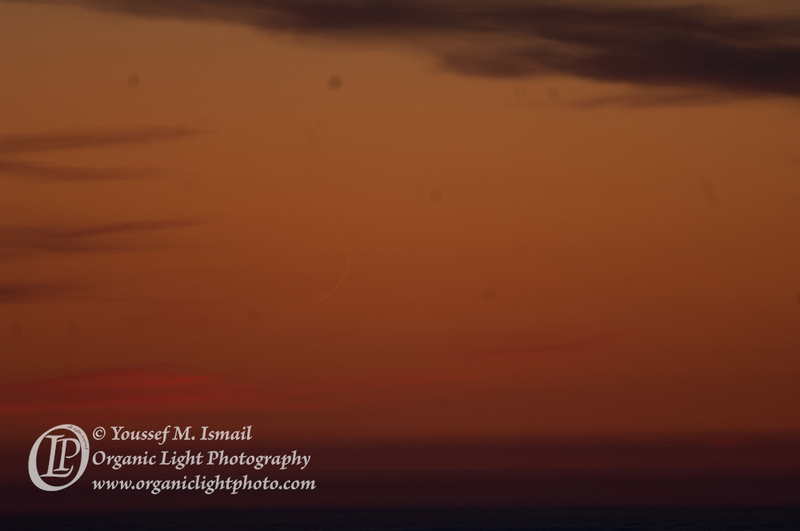 I ventured out again to capture this elegant crescent that was only 26.3 hours old from the moment I saw it pass in front of the sun. Needless to say it was quite awe inspiring. The moons last year did not disappoint. However the debates that revolved around the most certainly did. The Islamic calendar is a pure lunar calendar. 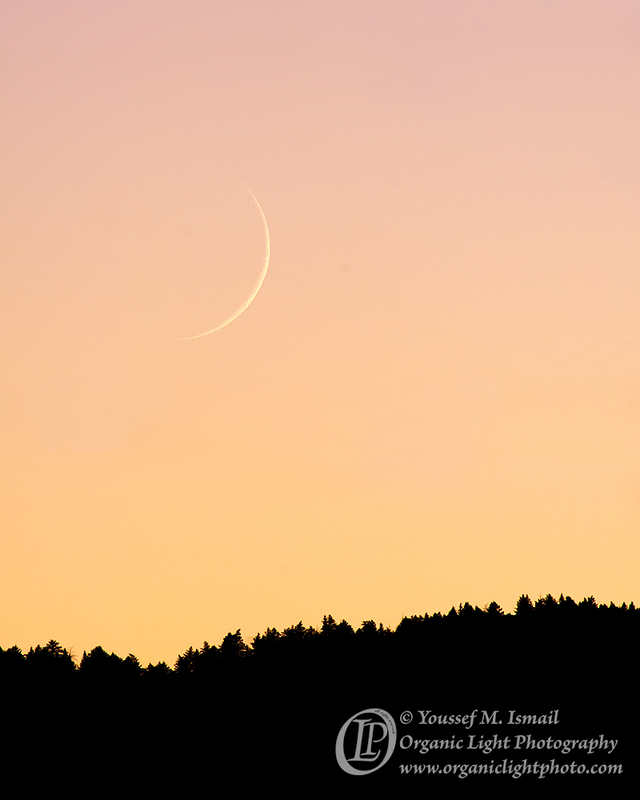 It is based on sighting the new crescent moon each and every month. In our modern world this seems to have become an inconvenience. It is unfortunate because it is a most cherished tradition. It is a tradition that helps us ground ourselves in reality rather than further immersing ourselves deeper into abstractions. The unadulterated mind sees things as they are not as they are conceived. Marking time by physically seeing an event occur is real, while marking time by a contrivance of the mind is not. The moon is real and when one looks to the sky and sees nothing one moment and then suddenly in the next moment sees the moon appears it has to leave that person’s heart in awe of the creative power that brought all of the universe into existence. At least it does for me. And so, these moons are a affirmation of the existence of a Creator and the photos of these thin ribbons of light hold great weight with me. There was one other heavenly event that was of worthy note, the transit of Venus. A transit of a heavenly body is when that body passes between the Earth and Sun. The transit of the moon could completely eclipse the sun due to its size and distance from the Earth. Venus on the other hand, is so much further away from the Earth and when it passes in front of the Sun it looks like a small dot. 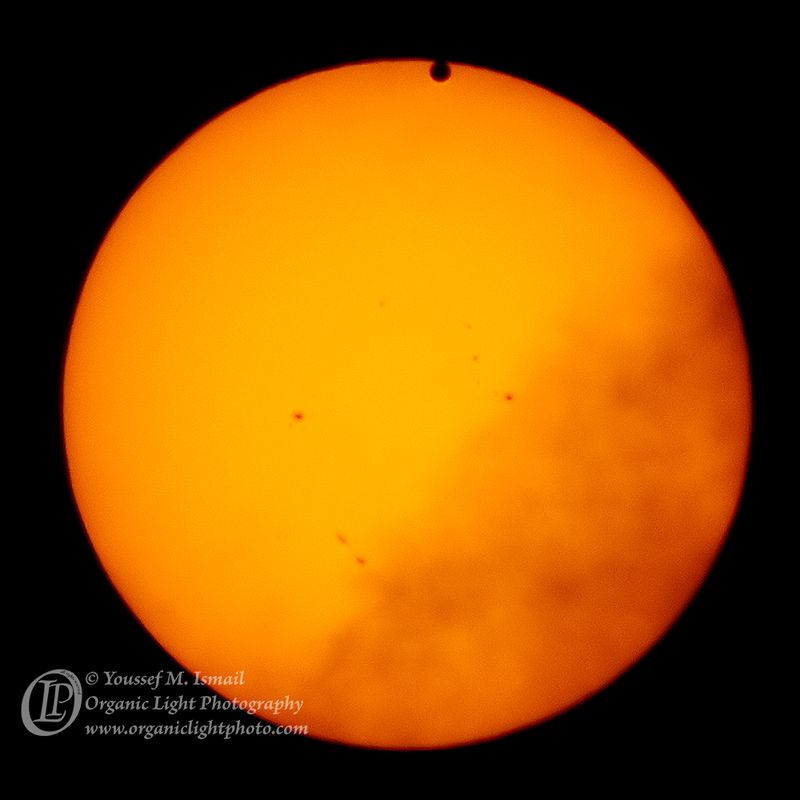 Nonetheless, the transit of Venus only occurs once every 105 years. Due to this rarity, the 2012 transit of Venus was an event that most of us alive on Earth today will never see again. Making sure I photographed it was imperative and was a pleasure to witness. 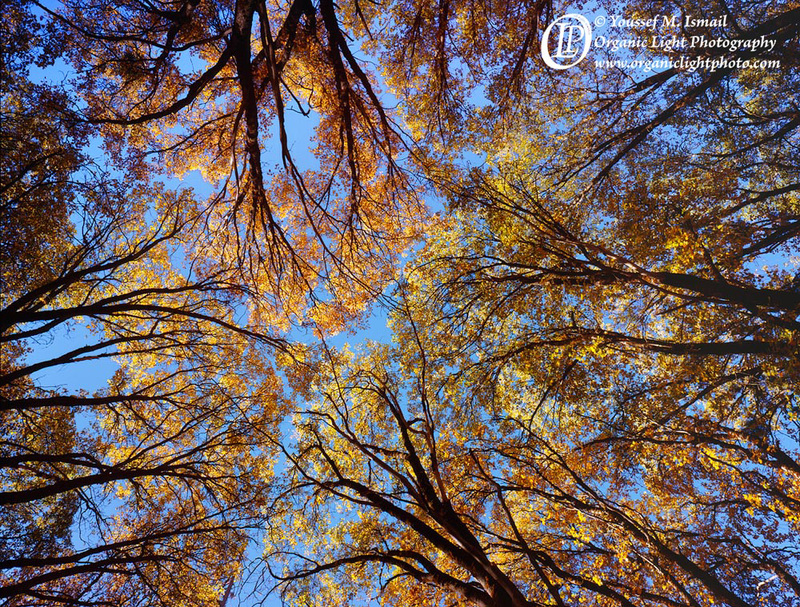 As summer waned my thoughts started to focus on autumn. I made it a point to make a trip to the Eastern Sierra imperative. As October rolled around I dusted off the camping equipment and gathered up the crew and headed off. We spent three days exploring and photographing that awe inspiring landscape. 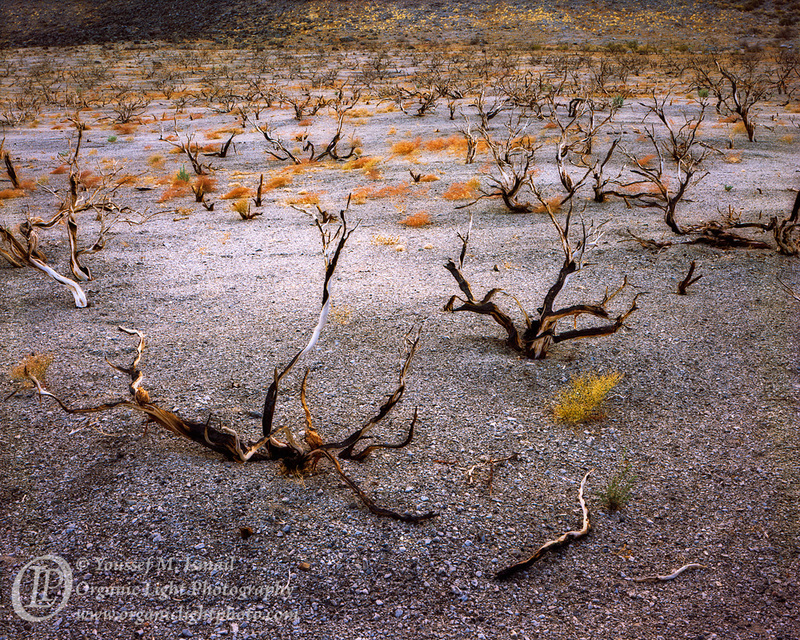 At the time I was feeling somewhat flummoxed about how my photography was perceived. Among the questions the raced in my mind was one that continues to bother me. Do people understand my photography, do they see what I see, does my photography move people the way it moves me? Then one morning while standing at the foot of the youngest mountains in North America, ‘Among The Dead’ was made as that very thought came to mind. I wondered if me heart was dead and I was among the dead, or if the hearts of others were dead and I was among them. Either I could not express my message, or it was not being received due to dead hearts. Later that same morning as the sun started to hit the Sierra Nevada range, they acted like giant reflectors bouncing this warm light onto the pumice field I was standing on and the burned sage started to take on an incredible appearance. 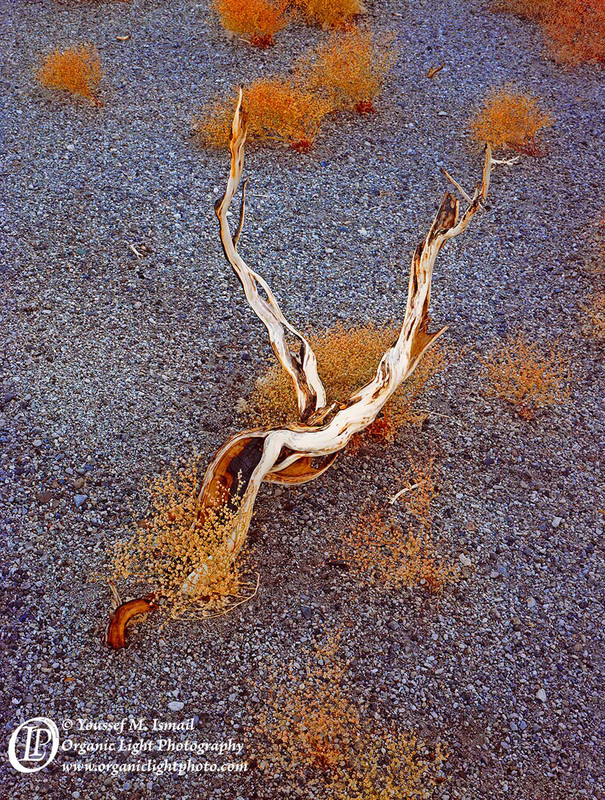 These burned twisted sangs were all that remained giving the feeling that I was looking at relics from an ancient time. When light, subject, color, and texture all come together as they did when ‘Relic’ was made, it is hard to come away with anything but a winner. 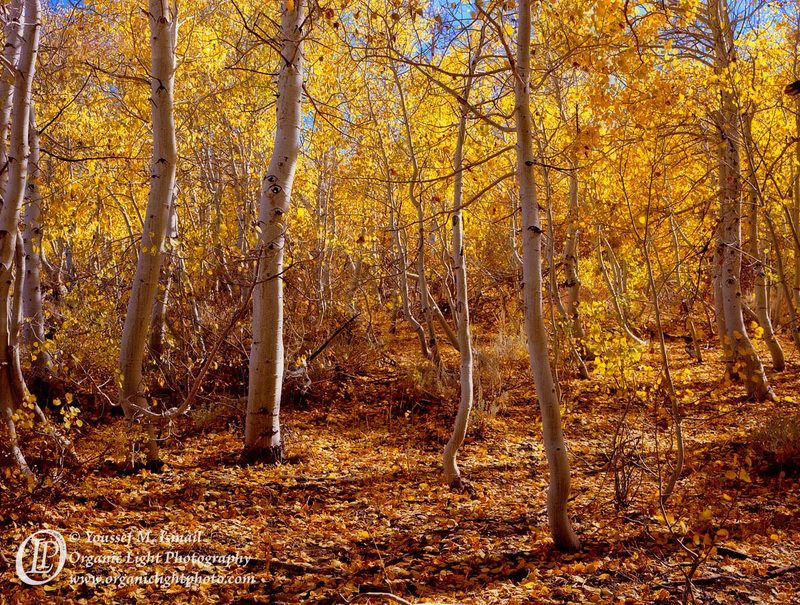 It was not long on the first autumn trip for my heart to find its winds and soar to great heights of joy with the glowing colors of the Aspens. 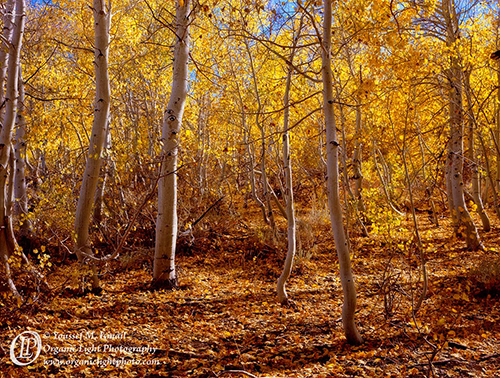 As I was wandering I came upon this stand of young Aspens in the warm afternoon light. They seemed to be dancing, in fact with the subtle breeze coming and going, the leaves would begin to shiver and almost twinkle in the sun. I wanted to dance in the light with them. I could not pass up the scene, and ‘Dancing In Light’ was made. 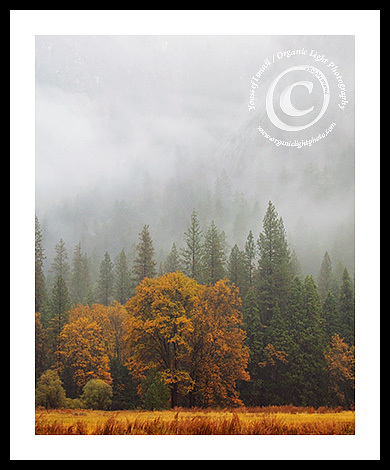 One of my all time favorite autumn images I think I ever made. 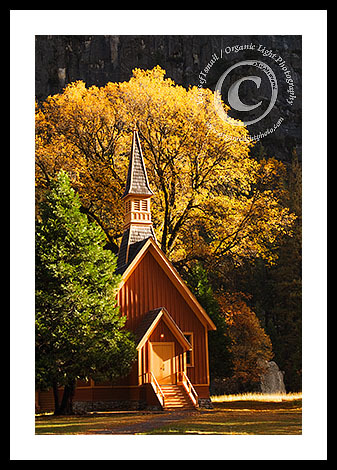 Autumn has to be my favorite season of the year and there is no place that I like in autumn better than in Yosemite Valley. I make the trek there every year and this year I made it alone. The crew, despite their pleading were left them behind. I love having them along, but the dynamic of making photos with them and without them is like night and day. Being alone allows me to wander and take my time without interruption. 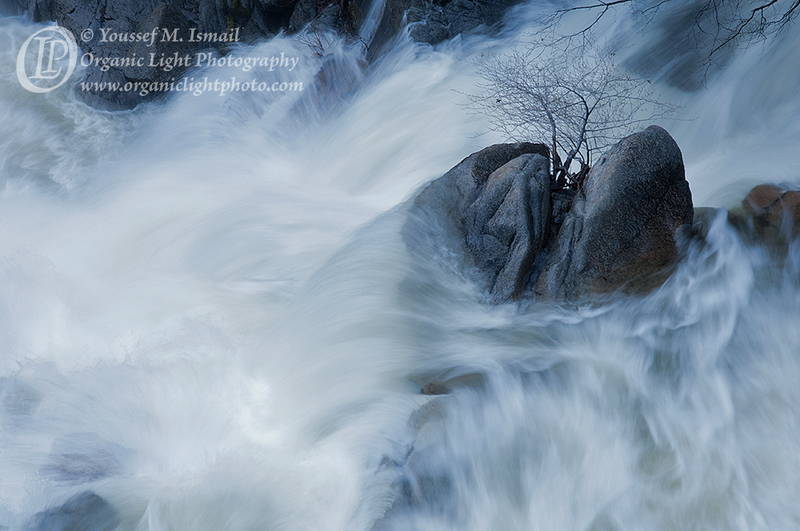 I can focus on the light and how it plays with the trees, the grass, water and rocks. My first morning in Yosemite Valley was strange. I needed to wander for sometime allowing my heart to unfetter itself from the virtual reality of the manufactured world with all its worries and demands to the true reality of the natural world with all it awe and wonder. 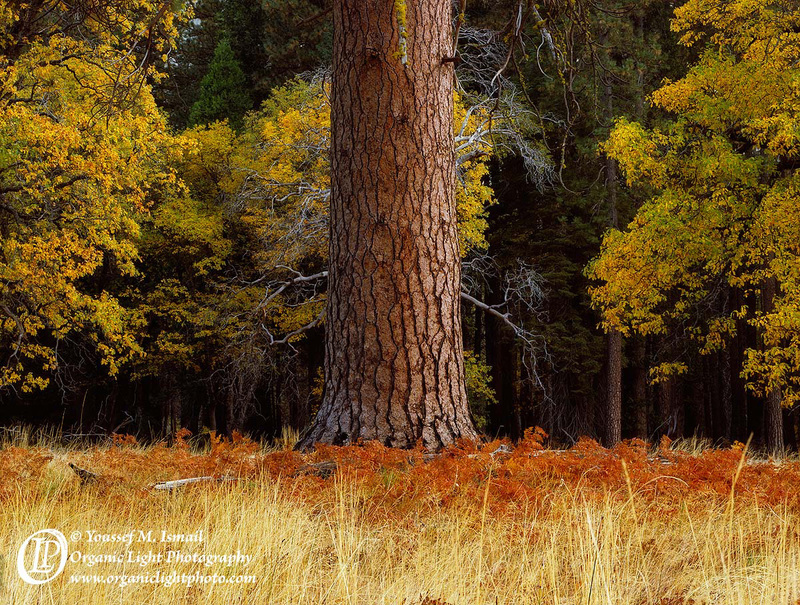 Once that happened I came upon this stoic Ponderosa Pine and I came away with ‘Anchored’, probably my favorite photo of the year. I spent three days in Yosemite this past autumn and it was quite productive. I exposed 60 sheets of film. Of those 60 about a third made to the scanner and were developed for print. Of course ‘Anchored’ has already been printed as well as ‘Among The Dead’ and ‘Dancing In Light’. 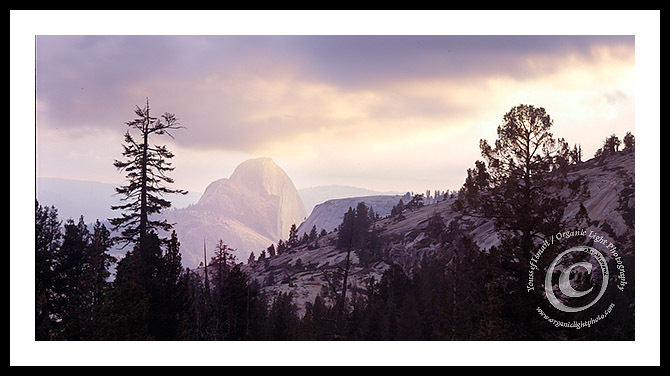 This next photo was also made on the first morning of my Yosemite trip. It was a photo that I have always wanted to do, and have always suggested to workshop clients, but for some reason it never was made. Well this year I did. 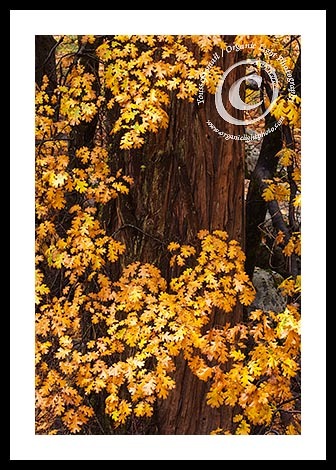 I walked into this small grove of Black Oaks in El Capitan Meadow known as the Cathedral Oaks and looked up. The light was perfect as the sun had just crested the tops of the peaks that surround the Valley and lit the tops of these trees. It was as if I was standing in a great cathedral looking through a stained glass window, only this cathedral was made, not by the hands of men for the sake of the glory of the Shaper of Beauty, but made by Shaper of Beauty so that our eyes may see and marvel at its glory. On the last night of my trip the campground I was staying in was empty. It was a Sunday night and I guess everyone that was there for the weekend had left. It was dark, somewhat cold and very lonely. As I was making my way back to camp earlier that evening, I decided I would try another photo that I had in mind for years. 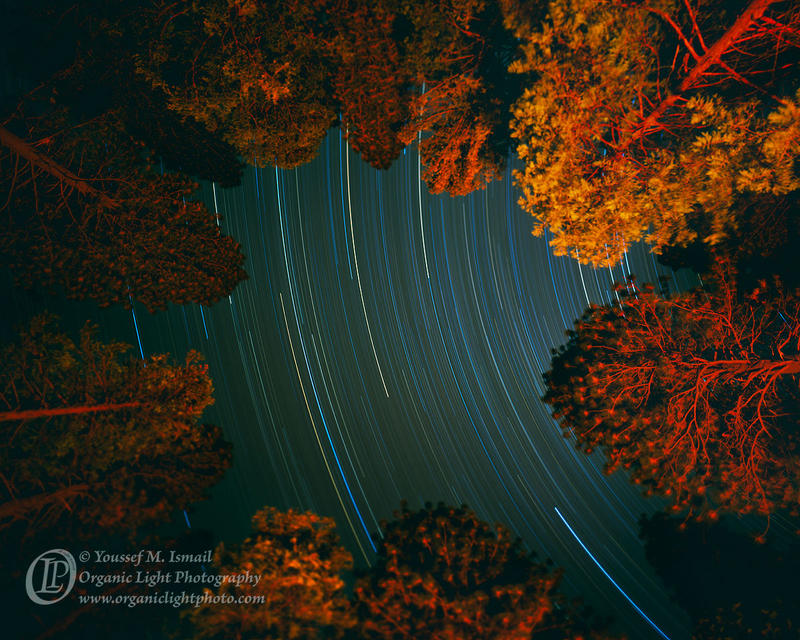 I always wanted to photograph star trails while looking up through trees. When I returned to camp it was already dark. By head light I started my campfire and then set up my camera pointed straight up again. It is difficult working with film in the dark as the exposure times needed usually run into the time frame of hours and film starts to lose its ability to record light faithfully after about a few minutes of exposure. This is called reciprocity failure. But I wanted to try it out. I focused as best as I could in the dark, removed the dark slide and opened the shutter. I let the camera sit there for three hours as I burned off the remaining wood I had while I ate my dinner and read a book. Around midnight the fire started to die. I closed the shutter on the lens and called it a night. Of all the photos I made in 2012, it was ‘Star Fire’ that I was most anxious to see when my films returned. The light from the campfire produced an eerie glow among all the trees in my camp, and the long shutter worked well capturing the streaking stars in the sky. 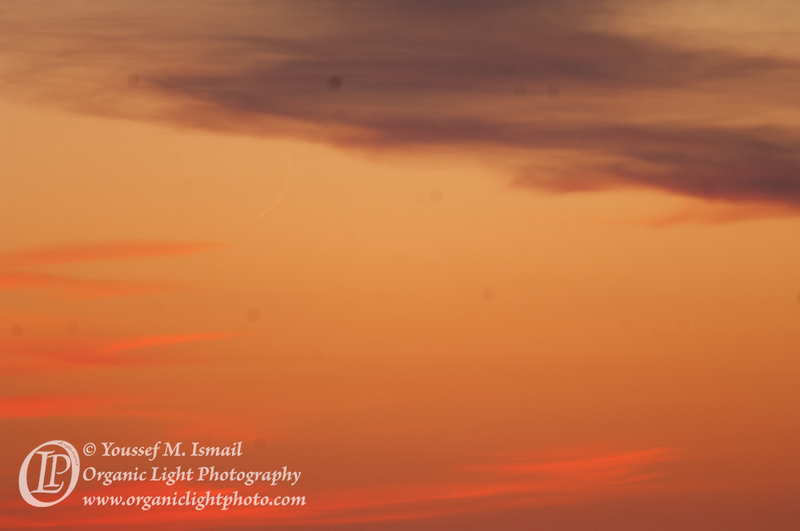 A photo that I am very happy with and one that I will try again in spite of reciprocity failure. The very last photo I made on my Yosemite trip was also the last photo I made for 2012. 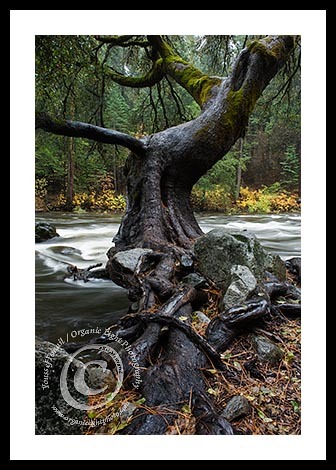 I photograph this stretch of the Merced River almost every time I am in the Valley, and it is a location that I visit each time without fail. I call this spot Happy Place. Everything that I love about the forest is found there along this small stretch of the the river. In the past the photos that I have made there concentrated more closely on either one or two trees and with or without the water of the Merced. This year I decided to try to capture the whole thing in one epic photo. This photo, ‘To Be Happy’, was made from two separate sheets of 4×5 film and stitched together in software and then developed. 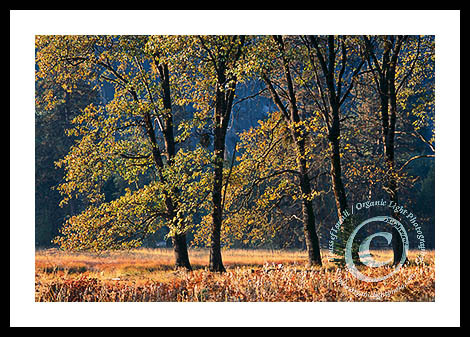 The resulting image has so much detail and resolution that a 40 x 90 inch photograph could be printed without any loss in quality. 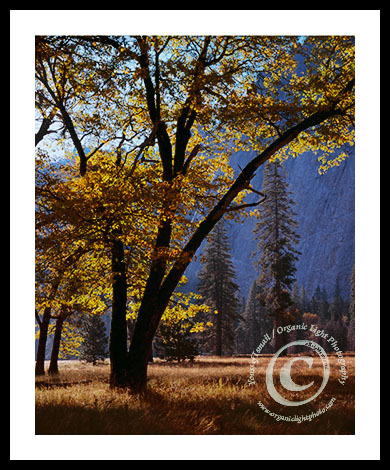 It has captured both the stoic grandeur of the pines and cedars that line the river as well as the delicate qualities of the dogwoods and maples that give Yosemite its autumn blush in some very soft and flattering light. I wish I could show you all the fine detail in this image online, but alas if you wold like to see that detail, it must be done in person. ‘To Be Happy’ will certainly have a spot in my exhibit shortly. Stay tuned for more information about that. Well, there they are. My favorite photos of 2012. I would love to hear your thoughts about these photos and leaving me a comment here on the web journal would be most appreciated. I hope you all have a wonderful and prosperous year in 2013, and maybe our paths will cross.